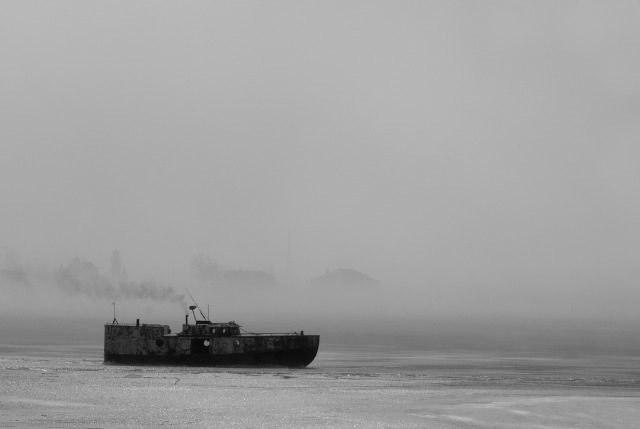 Frank Solle took this picture on Monday with the fish tug in the fog. You don't get much color in a photo like this, but the image speaks volumes about the harbor. As you will see below, Phyllis got some pictures in the sunshine the day before this was taken. What a difference a day makes! 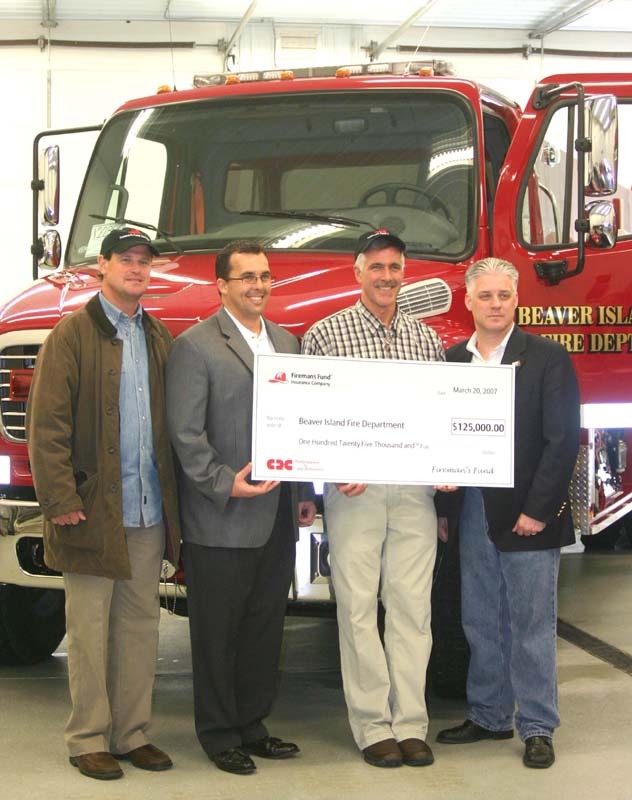 The Heritage Grant program of the Fireman's Fund of America insurance company has come through to provide Beaver Island with funding for the Beaver Island Fire Department. The grant was for the amazing amount of $125,000. So how did this come about? Lindsay McDonough works for CRC Insurance Services of Chicago, and so does Tim Turner. 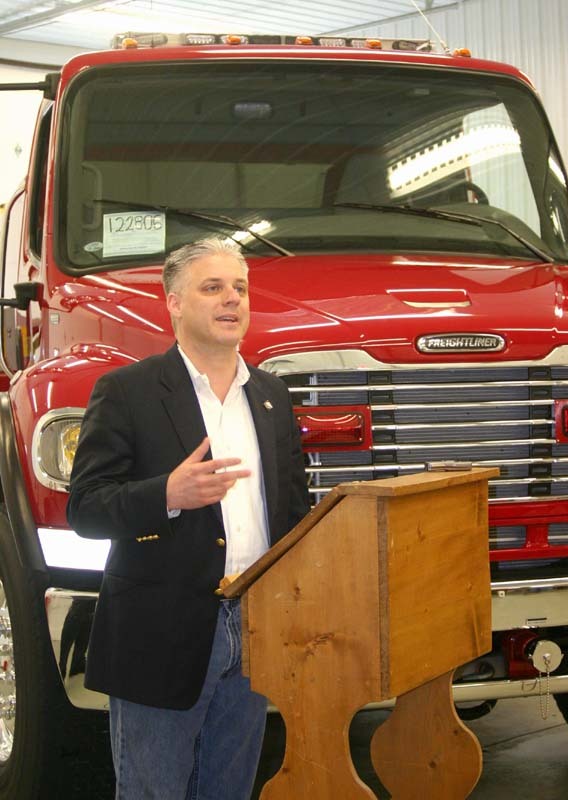 Since Tim Turner was the number one salesman of the Fireman's Fund insurance company last year, he and Lindsay were able to lobby for the grant to be given to Beaver Island . This grant was the largest grant given in the Midwest Region and the third highest grant given in the nation. 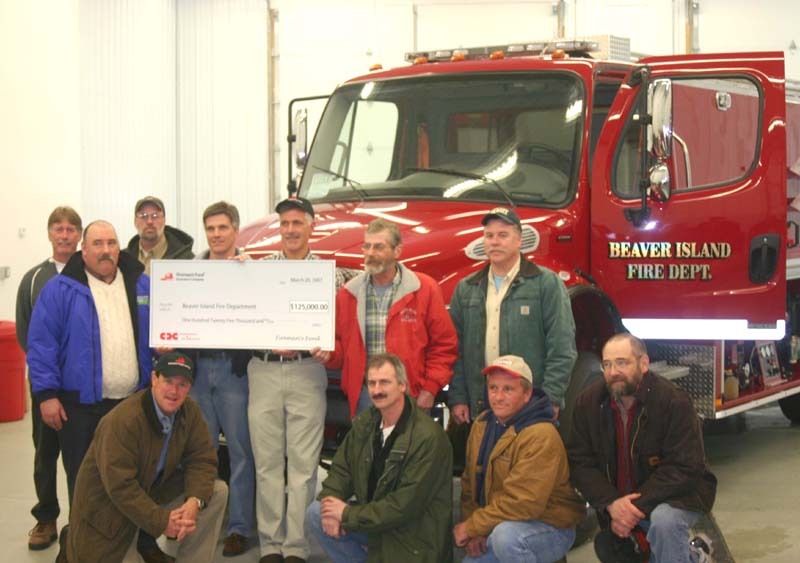 The check was presented at the Peaine Township Fire Hall on East Side Drive on March 20, 2007. Here representing the Fireman's Fund of America were Brian Blessing, Joe Shores , Jeanne Andrews, Katie Carmody, and Ron Mori. Tim McDonough, BIFD Chief, introduced Brian Blessing. Brian talked about the FF Fund, which was founded in 1863. 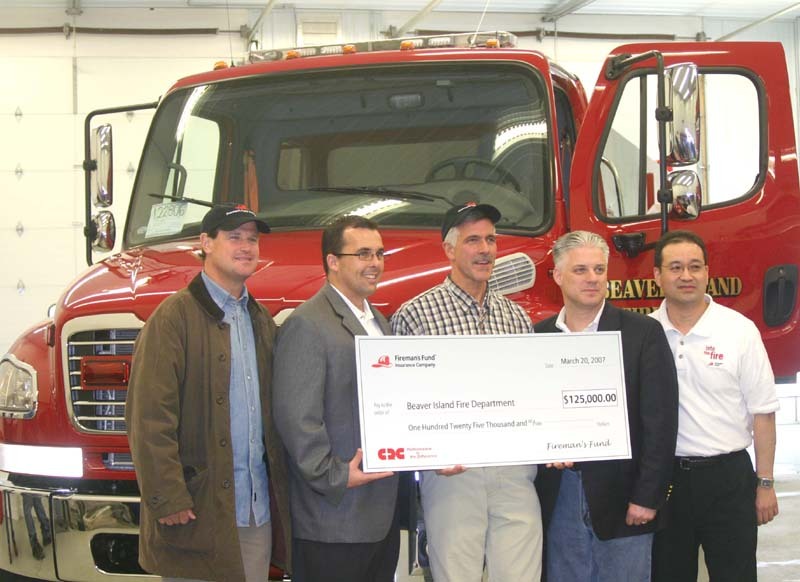 The Heritage Grant's purpose is to put part of the company profits aside to help fire services. As of today over 11 million dollars have been given to over 300 fire departments. Ron Mori presented the check to Tim McDonough, Fire Chief. “Thank you Chief McDonough. 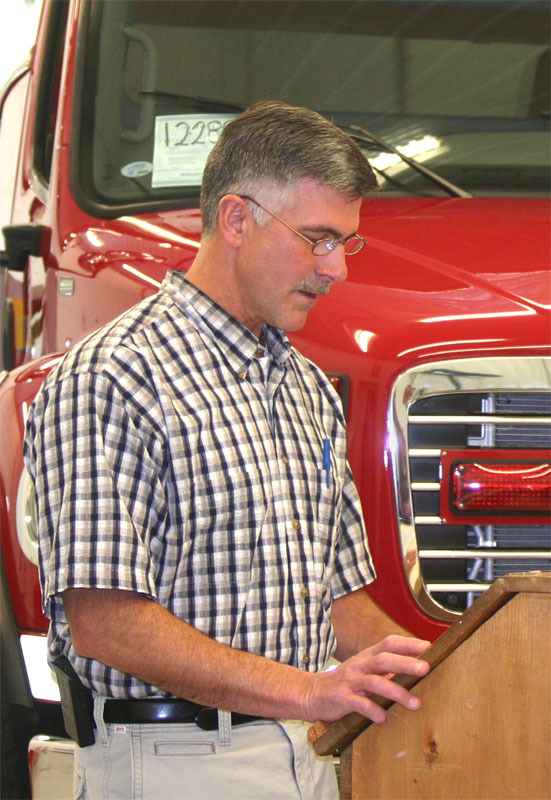 My name is Brian Blessing and I'm the regional sales executive for Fireman's Fund Insurance Company (FFIC). With me today from FFIC are Joe Shores , Katie Carmody, Jeanne Andrews, and Ron Mori. 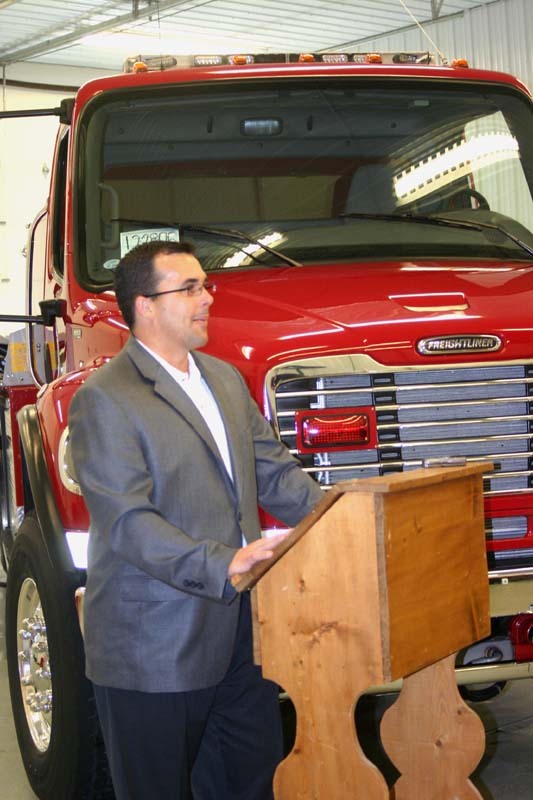 As you know, we are here to award a Heritage grant to your fire department along with Tim Turner and Lindsay McDonough from CRC Insurance Services. But, before we get to that, I would like to take a moment to tell you a little bit about Fireman's Fund Insurance Company and our Heritage grant program. “Thank you Brian. Over time, our mission has evolved into what we now call the Fireman's Fund Heritage Program. It enable companies who do business us, like CRC Insurance Services, the opportunity to direct grants to fire departments. Heritage grans help fund equipment, training, and fire safety education programs, based upon the specific need of each department. Since 2004, FFIC has proudly awarded more than 10-million dollars to over 300 different departments nationwide. As you can see, this is much more than just a check-writing campaign. It's about building relationships with our local fire departments….It's an investment in those who protect our homes, businesses, communities, and most importantly, our families. 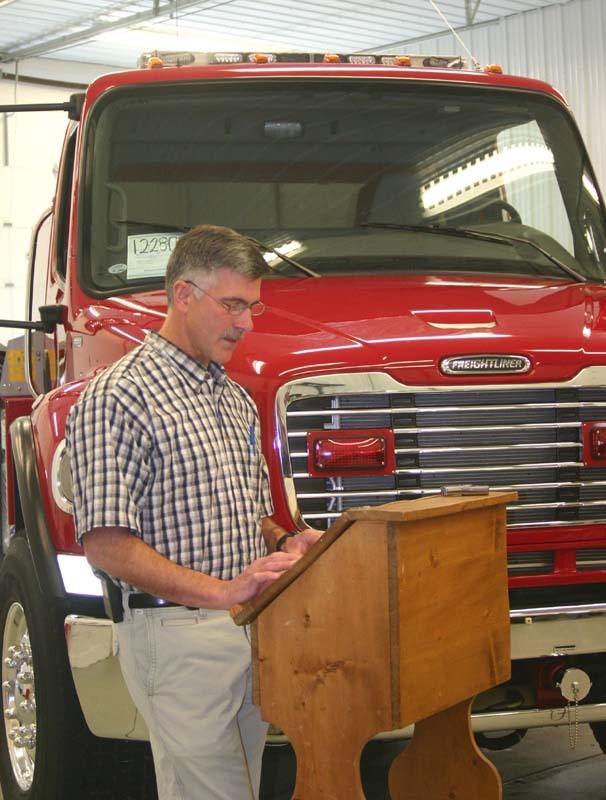 We understand the challenges fire departments face all across the country which is why FFIC is her to help.